Every time I go to see a werewolf flick, I’m thinking the same thing: will this be the second fantastic werewolf movie in the history of film? Time and again, of course, I’m disappointed. I’m not quite sure why the genre so often fails, especially when vampire and zombie films have a much higher success rate, but in the meantime I’ve gotten used to sub-par lycanthropic visions. The Wolfman is a decent film. It stops short of great but it’s entertaining nonetheless. This is supposed to herald the return of the Universal pantheon of monsters – if this does well, expect a glut of them featuring Dracula, Frankenstein’s monster, the mummy and God knows what else. Now that the diarrhoea of Van Helsing has been forgotten, I’m kinda excited to see a whole new breed of the classic monsters. The Wolfman presents us with some great writing. Andrew Kevin Walker (of Se7en fame) and David Self have teamed up to regale us with a tale so thoroughly Freudian that you’ll ponder a little bit too much about that dream you had about cleaning out your mother’s vase with a feather duster when your father came in and frightened you so much that you dropped it. It’s all there – sons falling in love with mothers, sons hating their fathers, sons terrified by their own puberty and a great spin on the Freud’s wolf boy case. I honestly can’t remember a film that revelled in Freudian theory quite this much. The acting is great for the most part. Anthony Hopkins proves once again that he is simply incapable of a poor performance. It doesn’t matter what rubbish he may be spouting, you can be sure that Hopkins will make it sound good. (He was the only thing worthwhile in Bram Stoker’s Dracula, and thankfully The Wolfman is a much better film than Coppola’s bizarre waste of money.) 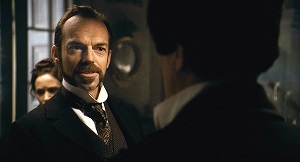 Hugo Weaving stars as Inspector Abberline (in an unexpected real life crossover with the Jack the Ripper case – you may remember Johnny Depp playing him in From Hell) and is in top form. The scenes with either of these two actors are instantly elevated above the rather dull B-grade feeling that pervades the rest of the film. But then we come to the single worst part of The Wolfman – Benicio Del Toro. Now, I admit I’ve never been a great fan of his, always considering him to be wildly overrated, but here he is well and truly dull. He shambles through each scene, mumbling whilst staring straight ahead with those dead eyes of his. I can understand that the studio execs got excited when they were first pitched the idea – he’s a huge, hairy man after all – but he’s simply not up to the task. We’re supposed to care for Lawrence Talbot, who has returned to England after his brother’s sudden and mysterious death (read: he was chewed and dismembered) but it’s simply not possible. It’s hard to believe that Lawrence apparently had a successful stage career in America, because he fails to inject any energy into his scenes. Trying to believe that Anthony Hopkins is his father is quite impossible, also – Hopkins gives his all but Del Toro doesn’t give anything in return. Trying to feel for the love story between Lawrence and Gwen (Emily Blunt) is just as difficult also. The effects are good enough, and it was a surprise to see that the creature actually did look like he’d come straight out of the black and white horror films of old, though I’m still confused as to why werewolves have to growl like lions or tigers instead of barking. They get to howl, sure, but both this and New Moon seemed to sampling big cats most of the time. The Wolfman is bit like Daybreakers, really. They both contain enough points of interest to keep the genres’ fanatics entertained but fall short of the great films they could have been. This entry was posted in Film Reviews and tagged Horror, Werewolf by Stuart Wilson. Bookmark the permalink.